Lots going on with this NWS map. Magenta in the southern Plains is a high fire risk. 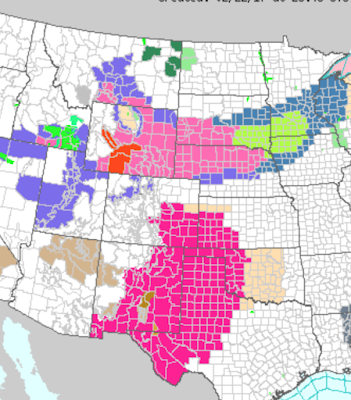 Lime green is a blizzard watch. The hunter green in the Upper Midwest is a winter storm watch. Green (Idaho) is a flood warning. The purple in the intermountain region is a winter weather advisory. Here is a computer model forecast for noon Friday. The low pressure system is on the Missouri-Iowa border. 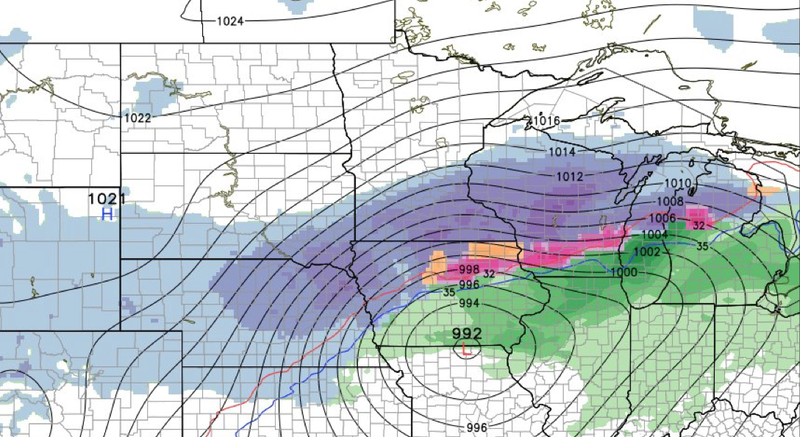 The solid lines are "isobars" = lines of equal barometric pressure. Where they are close together, the winds are high. Green is rain with darker colors corresponding to heavier rains. The orange and magenta are sleet and brief freezing rain. The purples are heavier snow (darker purples are heavier snow).